The Government has revealed that Innovate UK funding to businesses has reached nearly £5 billion since 2014. Innovate UK is part of UK Research and Innovation (UKRI), a national funding agency investing in science and research in the UK. UKRI works in partnership with universities, research organisations, businesses, charities, and government to secure UK’S position as a world leader in research and development. 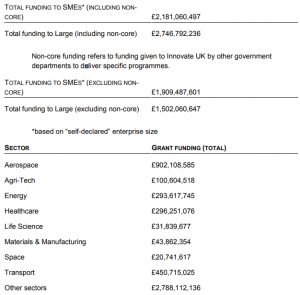 Answering a parliamentary Written Question, government Minister Chris Skidmore MP stated that Innovate UK’s total core funding to businesses since 2014 was £4,927,852,733. Sectors which benefited the most from this funding include aerospace, agri-tech, energy and healthcare. Mr Skidmore’s answer additional reveals a fairy equal split between funding allocated to small and medium enterprises (SMEs) and to large companies. “TIGA welcomes the level of R&D funding received by SMEs through Innovate UK. As an organisation that represents many SMEs and start-ups, we are pleased to see small businesses are not overlooked when it comes to funding allocations. “However, more can be done to support SMEs in the creative industries, including the video games sector. Access to finance is a major challenge for most of the UK’s 770 games developers. 33 per cent of respondents to the TIGA Business Opinion Survey 2019 said that the principal obstacle holding back their businesses was limited access to finance. Daniel Zeichner: To ask the Secretary of State for Business, Energy and Industrial Strategy, what proportion of Innovate UK grant funding has been awarded to (a) SMEs and (b) large companies since 2004; and what the amount awarded has been by sector over that period.